Our recent foray (Mike’s return) into real estate – the goal of which was to help others but also to find investment properties to build our own retirement (so that we could finally do what we love). The pivotal phone call Mike had received two months earlier from Tim Jacket of Tartan Yachts. Would Mike please consider taking the position of Factory Rep for the NW region of North America? What became clear to us in that moment was nothing more that what should have been obvious: We were to stop “beating around the bush”, to give up the “scenic route” to our lives’ destiny. We were nothing more than to do now what we have been ultimately called to do on this earth. Because “that which we love” is that which we do best, and that through which we best serve our community and our world. You see, from the time we first met, a vision began to grow of a group of closely associated business entities – based in Anacortes – that provide a wealth of services and mutually support each other. These services would be oriented around the marine environment, and focused on supporting people through education, consultation, top-line boats and gear, quality charters, sailing club, lessons and accommodations to support their love for exploring and learning in the Salish Sea. Mike’s life-long passion for, and experience with, creating highly effective business entities that provide highly rewarding work environments for employees and unexcelled customer service. Mike’s two favorite words: “systems and processes” – his keys to successful business practices. Mike’s 20-year legacy of establishing and developing Main Sail Loft in Omaha, Nebraska, which provided sailors in a 6-state region of the midwest with boat sails and service, sailing lessons, and retail gear. Mike’s encyclopedic knowledge of sailboats has its pedigree in selling and servicing a wide diversity of designs in those years: Sunfish, Laser, O’Day, Catalina, Tartan, Hobie Cat, NACRA, Holder, Hunter, S2 Yachts, Beneteau, Windsurfer, Mistral, Skimmer Iceboats, Melges scows, Johnson scows, Montgomery lapstrake sailboats, and others. Through the course of the business Mike did it all – sales, rigging, FG repair, bottom painting, bookkeeping, sailing school, windsurfing school, and marketing. As business grew, he hired and managed a crew to develop systems to effectively handle the growing needs of the community. Phyllis’s life-long passion for boats and the sea – starting at age 4 on San Francisco Bay; continuing through annual family cruises on the Salish Sea; racing Fireballs and J-24s through adolescence; studying and planning for her childhood dream of sailing around the world; living and working on boats in the waters and islands of the SE Alaska archipelago for 18 years; and more recently finding a passion for planning and leading kayaking excursions throughout the Salish Sea. Phyllis’s career dedication to quality education – whether teaching college classes for the University of Washington and the University of Alaska, Raven’s Backyard classes in the wilderness of SE Alaska, or the young high school science students in Everett. In the process, Phyllis has become an expert at curriculum development and implementation. Phyllis has long supported other teachers in professional development, leading district science staffs across the state in adopting more rigorous, inquiry-based teaching practices. After the intensive process of becoming a National Board Certified Teacher in 2008, she has since formally and informally supported other NBCT science teacher candidates in realizing that goal. New Yacht sales of the best-quality boats in the industry. You can bet that Mike knows what they are and knows them intimately. 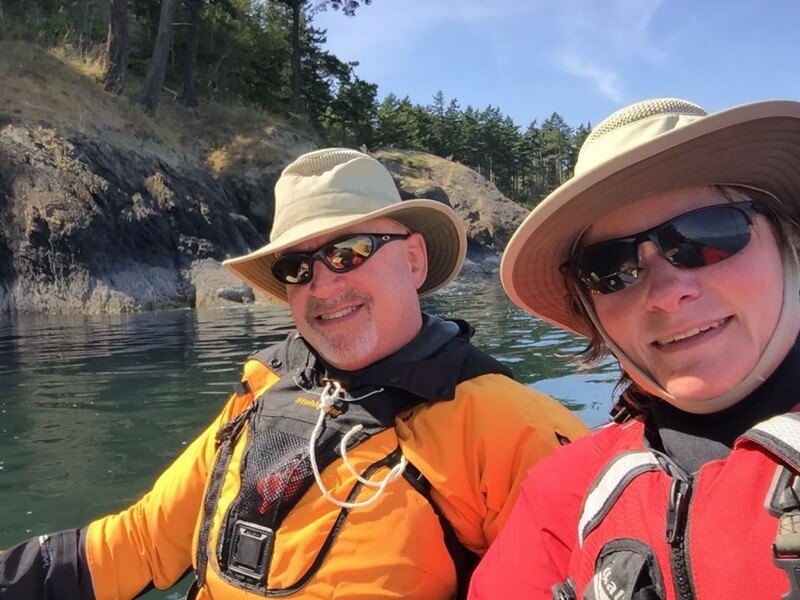 Boating education for aspiring and experienced sailors and kayakers; plus educational experiences that deeply connect the individual with his/her natural environment (Raven’s Backyard reborn). Supported by both the yacht sales and the sailing school are the sailing club (Sail Anacortes) for community members who want to sail locally, and yacht charter services for those who wish to cruise longer and farther afield. History shows that a honeymoon is frequently followed, 9-months later, by a birth. We are a bit ahead of the curve. A month after our honeymoon, Shearwater Marine Group was born.